The “Occupy Wall Street” (OWS) movement, started from Zuccotti Park at the Wall Street in New York City on Sep.17, 2011. It expanded to 951 cities in 82 countries around the world1. The U.S mainstream media’s attitude towards OWS turned from ignorance, neutral, denial, to acceptance. Keith Olbermann, American political commentator criticized the initial media response for ignorance in the first five days.2 Also, Chen Weihua, deputy U.S. editor of China Daily followed with a shameful “media blackout”.3 However, both of them failed to give comprehensive and multi-dimensional analysis except for small sample data and subjective tendencies. To give an objective view on how U.S. mainstream media defined news value by media bias detection, this thesis tracked news coverage and analyzed the content of 4 specific mainstream media on OWS from Sep.16 to Dec.16 in 2011, including 417 publications on New York Times, 268 on Wall Street Journal, 487 news coverage on CNN.com, and 286 on NPR.org. The author combined literature research with discourse analysis to conclude that U.S mainstream media didn’t have adequate reports in the beginning but followed by regular coverage with little bias. The reason for ignorance maybe owed to OWS’s unclear goal and blocking by government. As their slogan, “We are the 99%,” OWS protesters represented themselves as the 99 percent which indirectly refers to the concentration of wealth among the top 1 percent of income earners, and the rest of 99 percent are paying the price for the mistakes of the 1 percent. The outline of big news during Occupy Wall Street movement from Sep.16-Dec.16 2011 can be summarized as the table 1 below. The Colbert Report satirizes the protest14. Major newspaper The Guardian15 and The New York Times16 reported on the protest. Keith Olbermann, a political commenter of Current TV, was the first mainstream media journalist who reported the full protest and criticized the ignorance of other mainstream media on Sep.21, the fifth day of OWS. He said they were “Ignored by those who presumably support them, by those who seemingly should just be reporting on them.”51 When Ginia Bellafante summed up “pantomiming progressivism rather than practicing it knowledgeably52” because of the ambiguous demands of OWS on The New York Times, Mr. Olbermann said “The protesters are not going to able to refine their goals based on reading bad reviews from the protest critics of the New York Times.53” However, Mr. Olbermann didn’t explain why NY Times should support OWS. Relevance: the effect on a likely or potential audience. Timeliness: is it a recent occurrence? Is there a good change the audience will previously have been unaware of this development? Predictability: could the event have been foreseen and if appropriate, planned for? Continuity: is it a new and further development in a sequence already established? Composition: is it particular suitable to the demands of that medium or news outlet? For example, editors may seek to provide a balance of different types of coverage, foreign and domestic coverage about the same domestic news. Elite peoples: is the subject of the story already famous? Elite nations: does it affect our nation, or nation we consider important? Negativity: is bad news always likely to be good news to the journalistic community? The most important hypothesis behind those factors is that the more factors an event satisfies, the higher the probability that it becomes news. If the media disobey the hypothesis, such as ignoring qualified-news or publish nonqualified-news (qualified means satisfy those factors above), we may suspect the media has bias. Media bias is the way media outlets or journalists violate journalism ethics and standards in selecting and reporting news. Different media have their own professional code of ethics, but most share common principles, such as truthfulness, accuracy, objectivity, impartiality, fairness, and public accountability.60,61. Therefore, the content of news value itself can mirror media bias. Once the media publishes qualified-news, the way of narration or comment reflects media bias. For example, when the media’s coverage on OWS inclines to negative attitudes, it reflects that the media considers the relevance of OWS as negative effect on a likely or potential audience. This relation can be summarized into the chart below. Based on this logical relation, this thesis narrowed down to analyzing the ignorance of coverage and partial attitudes within the discourse. To judge the performance of U.S mainstream media on OWS, many commentaries focused on whether media ignored or lacked adequate coverage or not. If yes, there would follow critics on media bias because of capitalism control. However, these commentaries were mainly based on authors’ subjective opinion or small sample of news coverage analysis (less than 30 days’ news coverage). In addition, there were some comprehensive perspectives on the process of OWS. Jonathan Weiler classified the response of media into 5 stages, from Denial, Anger, Bargaining, Depression, and Acceptance. He eventually highlighted the fact that the failure of a media spotlight postponed the recognition and resolution of problems, which was from the beginning, “Denial.”69 Anastasia Churkina described mainstream media performance in 3 steps, from Ignore, to Ridicule, to Undermine. It was said that media coverage peaked when arrests took place and mostly the independent foreign media gave in-depth coverage.70. Based on the small sample problem of previous literature research, this thesis tracked 1458 news coverage, including 417 news items from New York Times, 268 news items from Wall Street Journal, 487 news items from CNN.com, and 286 from NPR.org. News publications on New York Times and Wall Street Journal were queried from full-text database, ProQuest ARL (Academic Research Library) with key word “Occupy Wall Street” in the timespan from Sept.16, 2011 to Dec.16, 2011. News, special reports, commentary reviews, and op-ed were all included. CNN news stemmed from “search” engine with “Occupy Wall Street” on cnn.com, including video, news, commentary and special report. So did the search on NPR, but with more kinds of news coverage, such as radio and radio script. For the sake of content analysis, this thesis reclassified all the news coverage into hard news and soft news. Hard news uses factual approach to cover subject up-to-the-minute news, such as news, features, video news, radio news, on-the-spot interview announcement, and hearings.72 But soft-news tried to educate, advise, or entertain people through special report, commentary, interview, debate, illustration, readers’ letters, and op-ed. With the news coverage sample of the 4 media, the number of news coverage in time sequence showed media attention on specific news events during OWS. On the other side, to give an intuitive sense on the ignorance problem, the comparison of Tea Party and OWS protest on the quantity of news coverage in time sequence indicated whether the 4 media had bias on OWS. Based on the conclusion of analysis above, the author tried to deduce the reason behind the results and the need for further research on this issue in the end. The methodology frame of this thesis can be summarized into the chart below. This thesis chose 4 mainstream media as sample study, including New York Times, Wall Street Journal, CNN, and NPR. These 4 media horizontally covered multiple media, including newspaper, TV channel and radio, and vertically massive quantity and diversity of consumers. As for the outreach of readers or audience, according to the Audit Bureau of Circulations FAS-FAX Report on U.S newspaper in 2011, Wall Street Journal ranked the first among daily newspaper with total average circulation of 2,117,792, followed by USA Today (1,829,099) and New York Times (916,911).75 Meanwhile, New York Times reached the top on Sunday newspaper list with total average circulation of 1,339,462.76 CNN was positioned as the top one consistently on average cumulative audience over its competitors. Throughout 2011, CNN reached 99.4 million viewers, 20 percent ahead of FNC (82.8million), and 23 percent in front of MSNBC (80.7million), according to the report77 of Nielsen, a New York based global marketing and advertising research company. Even though Radio is alleged as old-fashioned media, half of Americans get local news from the radio according to Pew Research.78 NPR ranked the third based on number of people who click ‘like’ for each outlet’s Facebook page, following CNN and Fox News.79 It showed where NPR was heading on reaching audiences compared to other platforms and devices. With a network of 959 public radio stations, NPR reached 26.4 million80 listeners every week and 17.2 million81 visitors to npr.org every month in 2011. On one hand, New York Times, Wall Street Journal, CNN, and NPR held large readers and audiences in U.S. On the other hand, to satisfy the millions of outreach, it is reasonable to represent prevailing ideas rather than minor or marginal thought. Therefore, these 4 media are regarded as mainstream media in U.S.
Wall Street Journal was published by Dow Jones & Company, which is a subsidiary of News Corporation after an extended takeover bid in 2007. Prior to the sale to News Corporation, Dow Jones & Company was led by Bancroft Family for 105 years. The acquisition by News Corp. provoked media criticism and discussion83 on whether the news coverage would be inclined to rightwing under Rupert Murdoch, the chairman and CEO of News Corp. There are over 1458 numbers of news coverage from the 4 mainstream media, including New York Times (417), Wall Street Journal (268), CNN (487) and NPR (286). The Chart 3 below calculated the daily news number from Sep.16 2011 to Dec.16 2011. Sep.16 was the day just before the first day of OWS. Meanwhile, there was no aggregated report about OWS after Dec.16 until the author studied the statistics. The original data about Chart 3 is attached in Appendix—Data 1. From the consistency of the trends, New York Times constantly reported on OWS since Sep.27 after nearly 10 days’ silence, while Wall Street Journal cumulatively hit 14 days zero coverage, CNN 18, and NPR 32. The degree of consistent reporting showed the level of concern and importance. However, this was not the only factor. For example, NPR possesses less reporters and distribution than CNN. From a focus on the amplitude of the trends, it was obvious that CNN ranged the largest gap between the highest point and lowest point, followed by New York Times, Wall Street Journal, and NPR in order. NPR had flat coverage without big fluctuations. Still, it can’t be determined whether CNN responded to OWS related events or just because lack of other media agendas. Therefore, it was reasonable to check the relationship between the trends above and OWS events timeline. From news search on Google, the author pointed out the most popular (the number of clicks, shared) events as the big events of OWS (Chart 4), organizing into a timetable as Table 1 in Appendix showed. After integrating news events of OWS into the trends, the trends almost fit with most big events---- when the event emerged, news report followed on the 4 media. CNN and New York Times followed ups and downs in similar proportion. NPR usually lagged by CNN and New York Times’ trends. But Wall Street Journal sometimes went opposite, such as on the big events of Oct.2, Oct.5, Nov.20 and Nov.26. To some extent, this suggested that CNN and New York Times set parallel news agendas which sometimes opposed Wall Street Journal’s. NPR followed others. To compare the two, the coverage trends figured out whether this was the normal way for U.S mainstream media to report protests. Chart 5 (below) was calculated by the daily cumulative number of U.S. mainstream news coverage for Tea Party and Occupy Wall Street protests from the first day of each protest to the 30th day. The original data for Chart 5 was attached in Appendix—Data 2. To conclude, OWS was ignored by U.S. mainstream media at the beginning but followed regular event-oriented coverage. Nevertheless, the trends could just show an ambiguous concept. It still needed specific analysis in news content as below. 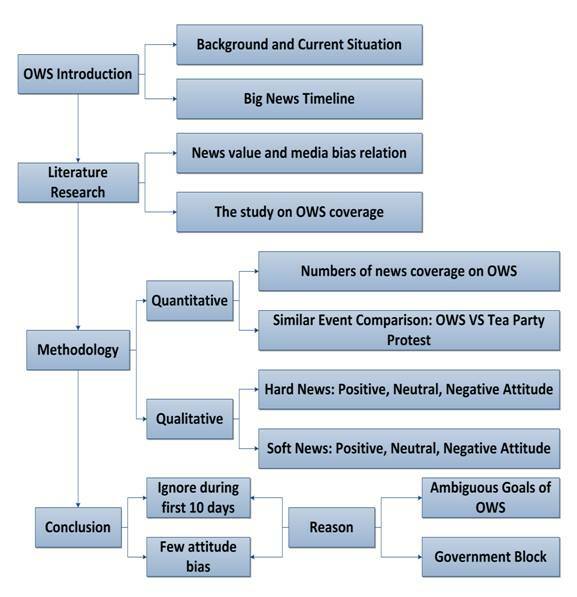 Content was analyzed by discourse analysis, including positive, neutral, and negative coverage analysis and collections of quotations in which journalists revealed their beliefs on OWS. The way to judge positive, neutral, or negative news coverage depended upon whether the news author supported OWS with obvious main ideas or hidden logic. The content of news follows with different types of news. Hard News is produced by regular journalists or other media’s reproduction, but soft news can be made by self-employed freelance, regular employee, special correspondent, or reprint from other media. Therefore, Hard News attitude can show certain media’s attitude directly but Soft News reflects media’s attitude by the selection of comments and their freelancers and critics. So Hard News and Soft News need to be analyzed separately. Take the following reports on New York Times, Wall Street Journal, CNN, and NPR as example. Although this was a live news report with 2 protestors’ quotations, Eyder Peralta emphasized positive words to describe OWS, such as “organized,” “expansive,” “progress,” “success,” and “new phase,” Meanwhile, Eyder denied negative words, such as “despite a sizable crowd that overflowed onto the streets,” “something the occupiers have vowed not to do,” and “something the occupiers have never done,” As a whole, it was easy to tell the positive support from the author. This news introduced how OWS protesters dealt with the descending temperature and other events. There was no complimenting adjective but all facts. Jassica Firger & Sumathi Reddy interviewed members and volunteers from Physicians for a National Health Program, protesters’ street medic committee, National Nurse United, Access Community Health Center. They described the whole health care system development from the former medic committee to cooperation among unions and formal organizations. In this update news, Joseph Goldstein pointed out “the loose protest movement” broke the law by marching in the street without a permit. However, Joseph ignored protesters to prove this conclusion. He interviewed police spokesman, police official, chairman of the city council’s public safety committee, and the New York civil liberties Union, but no mention about whether protesters had applied for permit or how protesters responded to police arrests. The ignorance of protesters reflected author’s inclination of a negative attitude toward OWS. The same way was used to analyze all the news coverage on the 4 media; the results are demonstrated as below in Chart 6,7,8, and 9. From the charts above among the 4 media, the neutral trends dominated the data and correspondently matched total numbers of trends, while the positive and negative trends were randomly and frequently positioned. This indicated that the major current thought of mainstream remained neutral but was combined with interaction of positive and negative attitude. As a result, the hard news reports didn’t turn to liberal or conservative bias. Positive Example : “Protesters: Today’s ‘rioters’, tomorrow’s righteous”, by Sally Kohn, CNN91. In this special report, Sally Kohn directly put “Suffice to say I’m sympathetic with their (OWS) critique that our economy and political system is too beholden to the interest of Wall Street . . . .” Moreover, in the end, she mentioned “I don’t wonder why people protest. I wonder why more people don’t join them.” It was obvious that the author supported OWS. This article was kindled from police crackdowns in Atlanta and Oakland. But Scott Neuman didn’t stand on any side of police or protestors. He started from the news facts, penetrated into the two’s perceptions, and gave opinions on how violence affected each side. Even though he ended with “an impact on police,” it didn’t weigh much on police side since it did stress the influence of OWS on politics and ‘”long-term endeavor” for the future of protest. Using the same way to analyze all the news coverage on the 4 media, the results are demonstrated as below Chart 10,11,12,13. Compared to the Hard News chart, it was obvious that Soft News’s negative and positive trends fluctuated more heavily than Hard News. However, neutral trends still led the largest percentage. Because Soft News was embedded with author’s opinion, positive or negative attitude was reasonable within the content. So, to evaluate media bias on Soft News is to balance the weight between positive and negative. From the total number, except WSJ, the other 3 media had more positive than negative soft news. Specifically, NY Times (41 Positive: 17 Negative), CNN (60 Positive: 31 Negative), NPR (40 Positive: 30 Negative) and WSJ (20 Positive: 24 Negative). This could reflect mainstream positive inclination toward OWS, but we still need micro track on the flow of numbers. A look at the 4 media’s trends of positive, neutral, and negative attitude, it showed that NY Times and WSJ became negative, but NPR and CNN expressed positive at the beginning 10 days. Then positive and negative interwove with each other, but positive won in the end of sample date. This means mainstream media may hesitate about OWS’s purpose at the beginning, that’s why positive-dominant or negative-dominant phenomenon existed. With the emerging of the OWS movement, mainstream media followed with hot discussion, so that positive and negative interweaved with each other. In the end, positive got small but won based on absolute numbers. Therefore, mainstream media didn’t have an obvious bias on OWS movement because the data matched the logical process of events. According to the analyses above, U.S mainstream media did lack adequate coverage on OWS at the beginning but followed with regular reports. Additionally, there were few attitude biases on the content. However, the reasons for ignorance and bias still need further study. Here are two reasons the author can deduce. After election there should be no financial or gifting requirements to meet privately with elected officials. Televised, public and transparent investigations in to the financial meltdown. Televised, public and transparent investigations into Social Security funding. Foreign relations that will allow the US to compete in World Trade. Reporters Without Borders, a nonprofit advocacy group degraded the annual press freedom of U.S. from 20 to 47 because of “the many arrests of journalists covering OWS protests.99 There were 76 journalists in 12 cities in the U.S. since OWS began100, including professional press, freelancers, photographers, independent filmmakers and citizen journalists, charged with trespassing and disorderly conduct, although it was clear from the video that some recorded that some were just doing their job.101 This violent block from government threatened and stopped coverage by journalists. However, the weakness of this analysis was the over-dependency on the author’s subjective judgment on the attitude of each report. To improve this, it may need further research on how to control subjective variables. Bin, Xin. 2002. On the Methodology of Critical Discourse Analysis. Journal of Foreign Languages. General Serial, 2002, Vol. 142, pp:35-41. Center, The Pew Research. 2011. Wall Street Protests Receive Limited Attention. Washington,D.C : s.n., Oct 12, 2011. Fowler, R. 1991. Language in the News: Discourse and Ideology in the Press. London/New York : Routledge, 1991. Hengjun, Yang. 2011. Biased China Daily Editorial Shames China. China Media Project. [Online] Oct 6, 2011. [Cited: Mar 20, 2012.] http://cmp.hku.hk/2011/10/06/16068/. Jason, Miks. 2011. Occupy Wall Street Ignored? China Power. [Online] Oct. 4, 2011. [Cited: Mar. 12, 2012.] http://the-diplomat.com/china-power/2011/10/04/occupy-wall-street-ignored/. Foad Izadi, Hakimeh Saghaye-Biria. 2007. A Discourse Analysis of Elite American Newspaper Editorials, Journal of Communication Inquiry, April, 2007, Vol 31:140-165. Thompson, J.B. 1990. Ideology and Modern Culture[M]. Cambridge: Polity Press, 1990.